In her debut album, Stacy chronicles her fight back from a traumatic brain injury in all its heart-wrenching details. Selections composed by Greg Maroney inspire healing, peace, tranquility, purpose for musician and listeners alike. Listeners can delve deep into their emotions to find peace in their own personal journeys. Thirteen powerful and emotional tracks are included in this album entitled "Taking Back My 1ife." Join Stacy in her inspirational journey to feel whole once again after a brain injury completely changed her life as she knew it. "Maybe you're still in the really hurting part of your journey. Maybe you feel more despair than hope, more discouragement than encouragement, more resentment than gratitude. That's where I was at the beginning of 2017 when I released this album. I was still wondering what would happen in my life, if I would ever recover, how I could shake the despondency and lack of meaning and loss and sadness. The songs in my 1st album are raw and emotional, but thankfully, music provided a way for me to express my innermost thoughts and feelings in a constructive way that allowed me to heal." 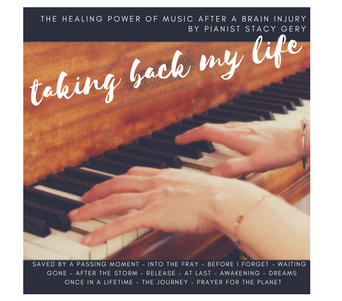 Stacy's 2nd album in her Music for Healing series was released in September 2018 and continues to chronicle her fight back from a traumatic brain injury nearly three years prior. Stacy has no doubt that music saved her, enabled her recovery, provided a new job and reason for being. The music of 2become - 15 songs from composers Greg Maroney, Robin Spielberg, Rachel LaFond, Michael Logozar, and Ludovico Einaudi - describes Stacy's transformation to whole and happy, with new identity, finally at peace with all that had happened. If you don't have a CD player, you may LOVE this cool new technology! Wafer cards are like a flashdrive, but the size and shape of a thick credit card. A little tab pops up to plug into a USB port, either in newer cars or a computer. It's a way to listen to, purchase, share and gift Music for Healing for someone who doesn't have a CD player. The wafer cards have more capacity than a CD, so contain 2 albums on a single wafer card. 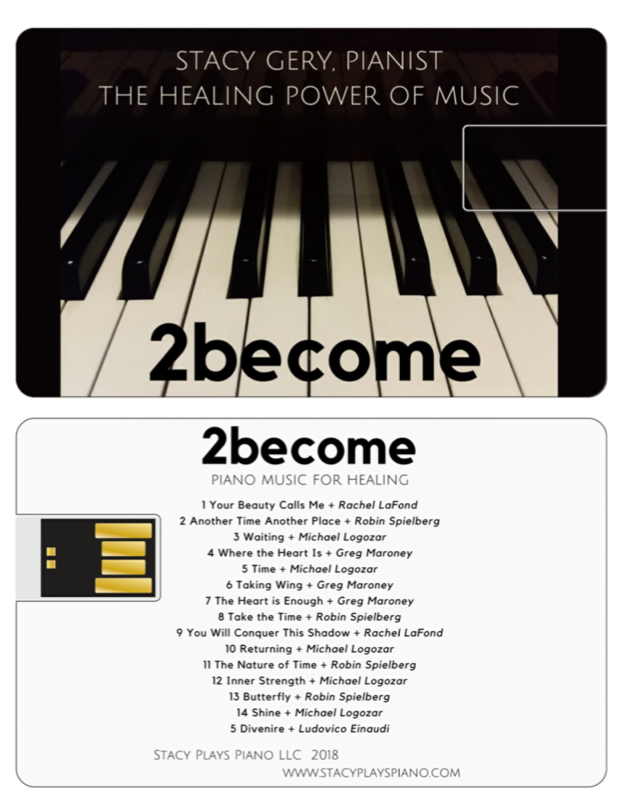 The wafers include both of the Music for Healing albums - Taking Back My 1ife and 2become, nearly 2 hours of music - in one handy little card!